The Little Family invites you to enjoy a boutique winery experience. Little Vineyards Family Winery and tasting room is nestled in the heart of Sonoma Valley, on their 23 acre family estate vineyards. 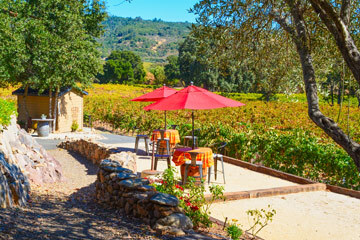 Showcasing the gorgeous views between the rocky slopes of the Mayacamas and Sonoma Mountain Range, visitors are welcome to sit on the patio and relax while enjoying our award winning, estate grown wines. Find the secret that few have found but all become passionate about. Due to our Little size, all groups over 5 people require advance reservations. Enjoy a sampling of our current release, Estate grown wines. 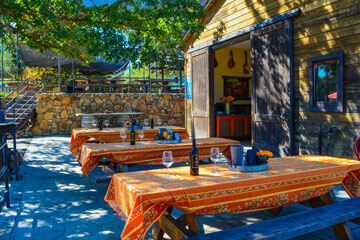 Guests may enjoy their tasting in our salon or on the patio overlooking our vineyards. Indulge your palate with our line-up of gold medal award winning wines. Taste through five wines from both our library and current releases that have all won Gold or Double Gold medals. We welcome small groups from 6-12 people for tasting on our patio or crush pad. Unfortunately, we cannot accommodate groups larger than 12. Contact us for information and availability.